Our friends had a Summer BBQ this weekend complete with good food, good friends and a whole lot of adult bevs. Even though the hostess told everyone not to bring anything, how could I not? 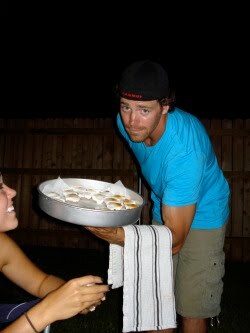 I mean, I basically live for situations like this- parties are a perfect excuse for desserts! And she knows me well enough to know that I was going to bring something anyways. 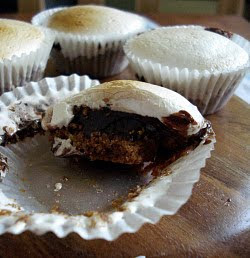 I feel like s'mores have recently been making appearances all over the place in the form of cookies and bars, but I have yet to see them like this... a sort of little, mini, bite-size s'mores tart. I like to think of these Bite-size S'mores as a more gourmet version of the summer and camping classic...don't worry, you still have your graham cracker, chocolate and toasted marshmallow, just in a more convenient one bite form...perfect for the times where some marshmallow-y goodness is necessary, but a fire just isn't happening. 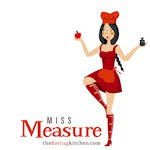 are going to get to a fire..
Preheat oven to 375. 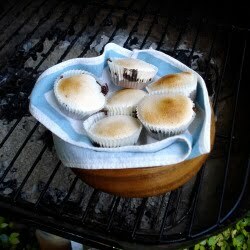 Line mini cupcake pan with paper liners. Graham Cracker Crust: In a large bowl mix crushed graham crackers (I used my food processor), melted butter and sugar until consistency of sand is reached and ingredients are well combined. 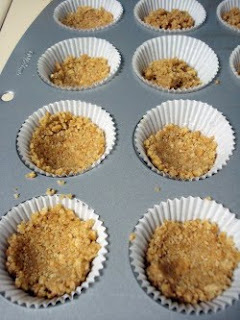 Place a tablespoon of mixture into each cupcake liner and using the back of the spoon, press mixture down until compact- think graham cracker crust on a pie. Bake for 10 minutes then cool for 20 minutes on rack. Easy Chocolate Ganache: While crusts are baking, heat 1/2 cup heavy cream in the microwave for about 1 minute (until its good and hot). Add cup of chocolate chips and whisk constantly until smooth and creamy. Set aside to cool. 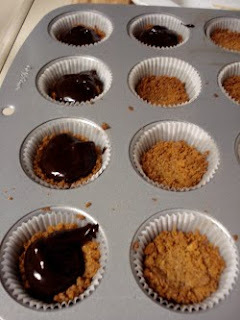 After crusts and ganache are cooled, place a tablespoon of chocolate onto crusts. Place in freezer for at least 30 minutes so chocolate will set. 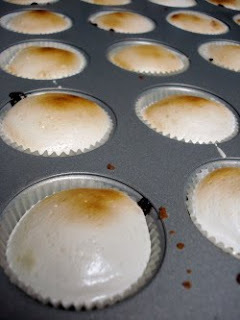 Toasted Marshmallow: Remove tarts from freezer. Set oven to Broil. Fill a piping bag or large zip-lock bag with a jar of Marshmallow fluff (this is just to make it less of a mess, if you want to spoon it on top, by all means don't let me stop you). Place a dollop of fluff on top of each tart. To get the toasted effect place under broiler, leaving the oven door slightly cracked to tell when you've got that perfectly toasted top. And Voila! A perfect one bite summer classic. I love s'mores.... I truly do.